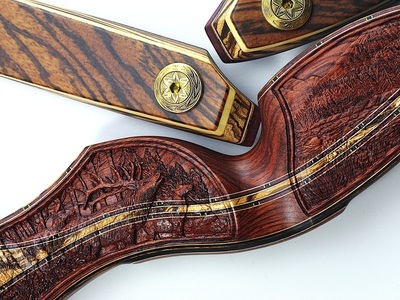 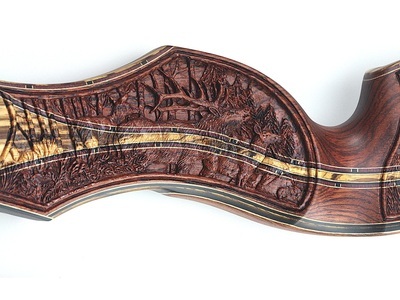 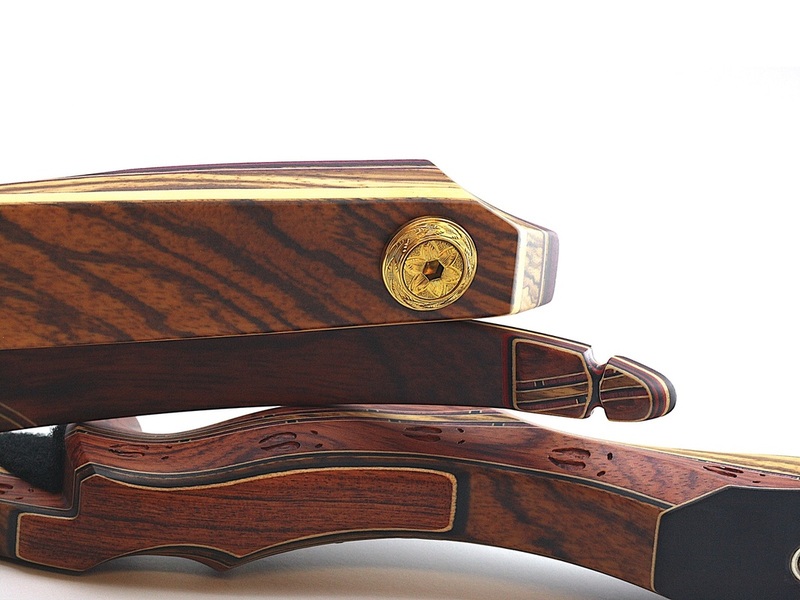 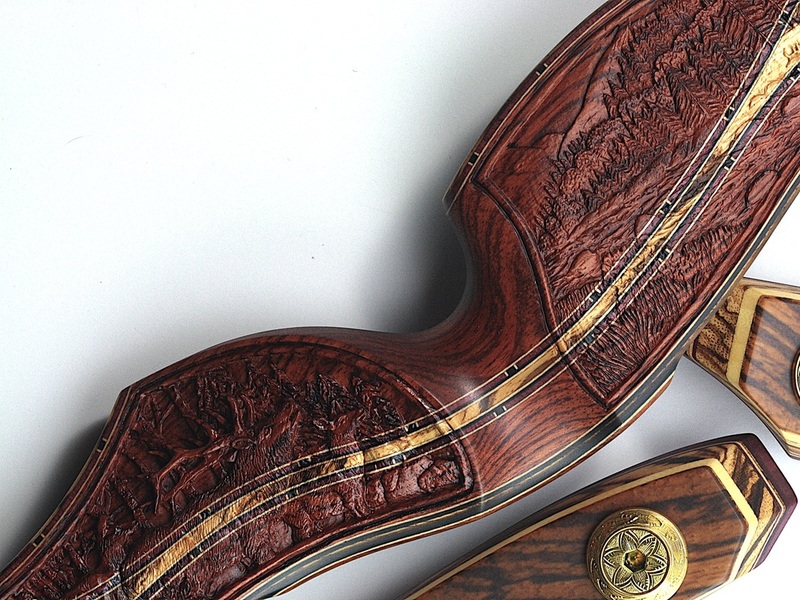 Our latest hand-carved Legacy Series bow offering is breathtaking! Our mission at Blacktail is to produce the finest traditional archery bows in the world. 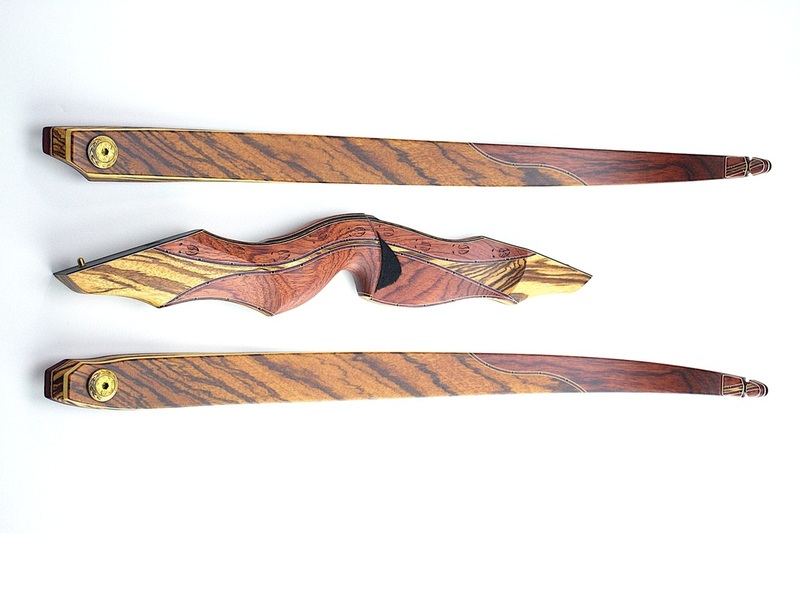 Our Legacy Series bows set the benchmark. Carefully thought out in every way, it is a one-of-a kind, fully functional work of art. 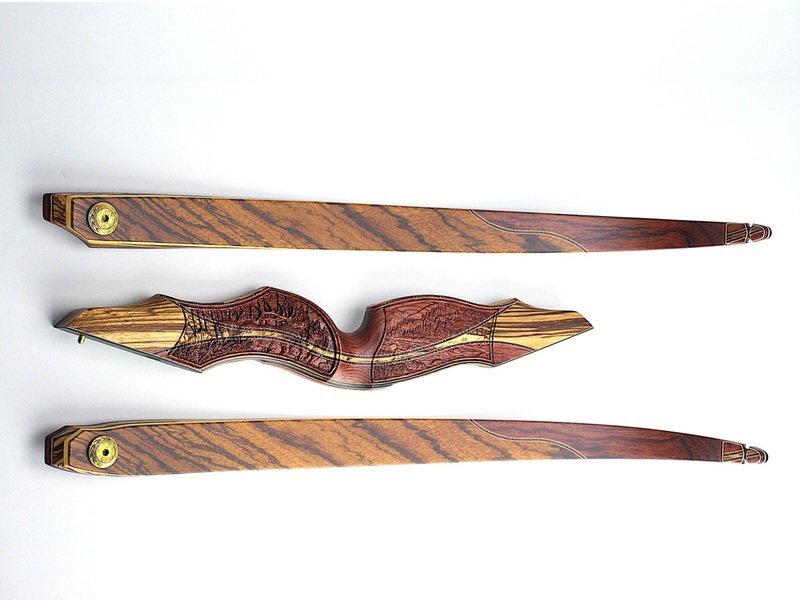 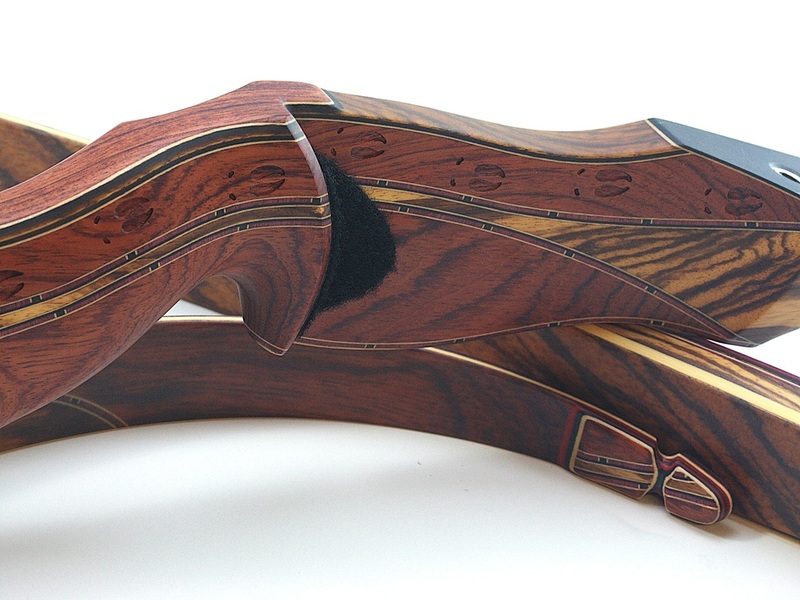 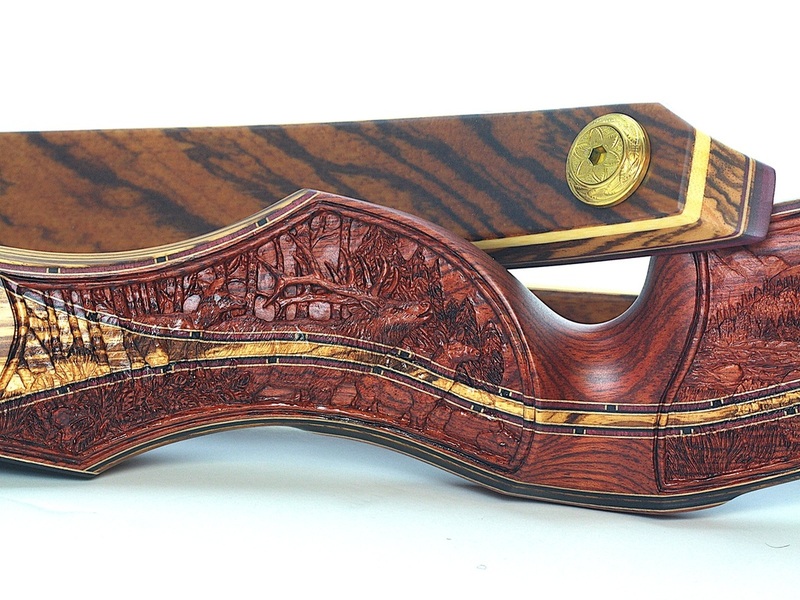 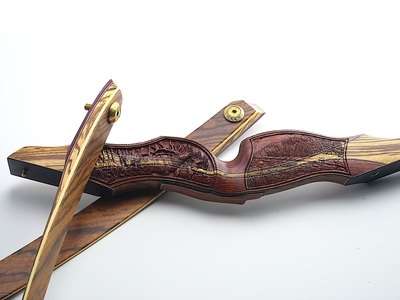 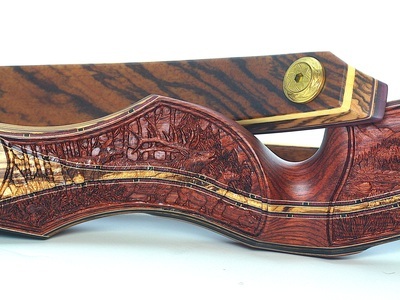 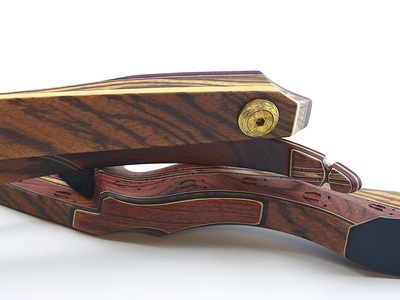 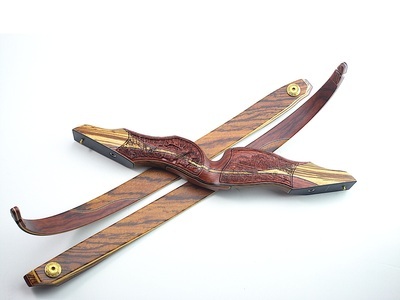 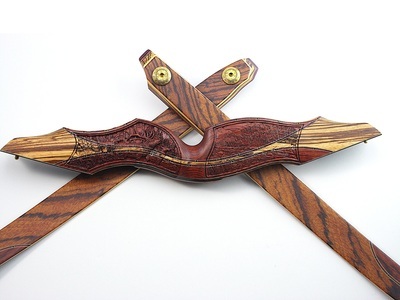 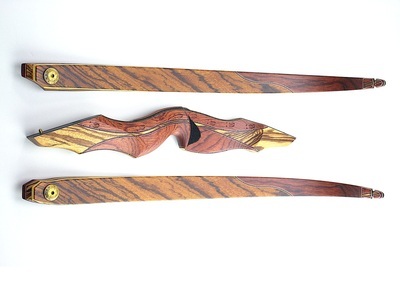 This stunning bow is truly an heirloom piece any serious high-end bow collector will certainly cherish. 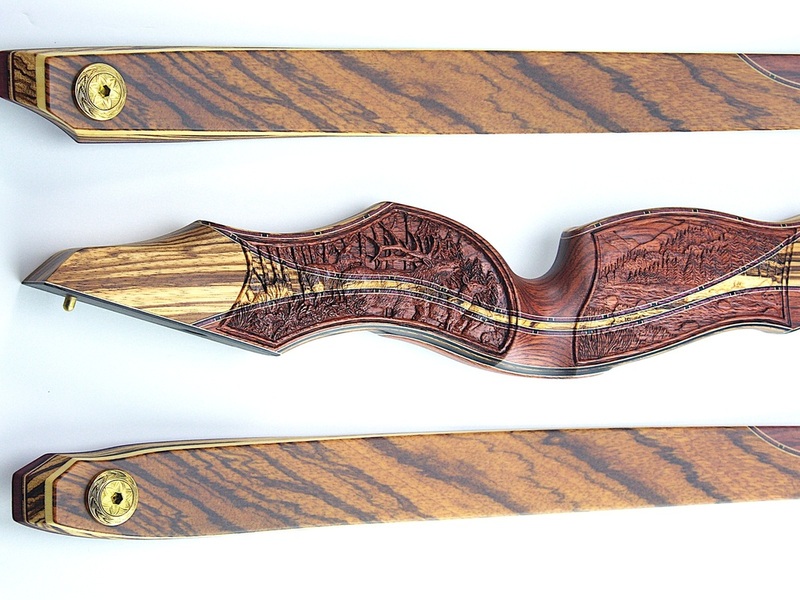 This Blacktail Legacy Series bow was hand-carved in the USA, utilizing the 19" Elite riser configuration. 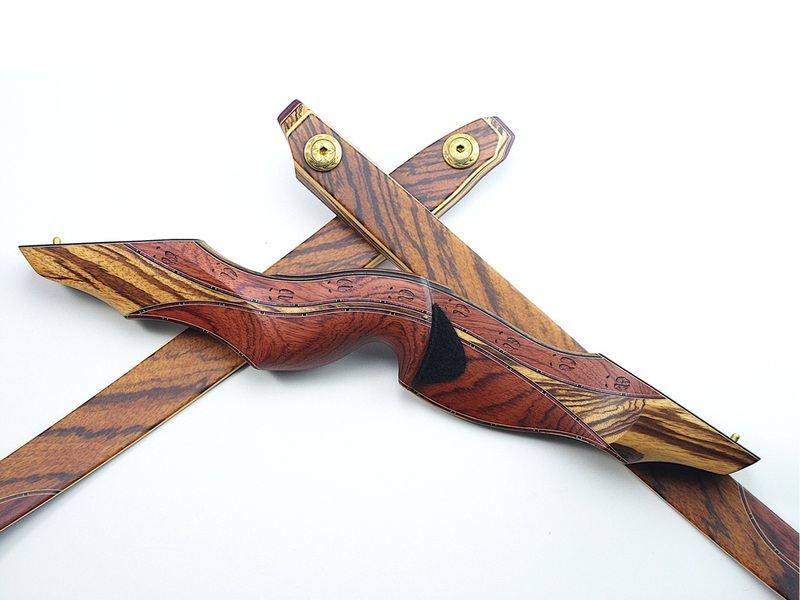 Bubinga and Zebrawood, are incredibly hard woods and among the most difficult (and time consuming) woods to carve. Yet the strength and durability of this wood combination results in a treasure designed to last a lifetime. A series of tastefully hand-carved elk tracks (on one side of the riser) foretells a story unveiled on the opposite side. 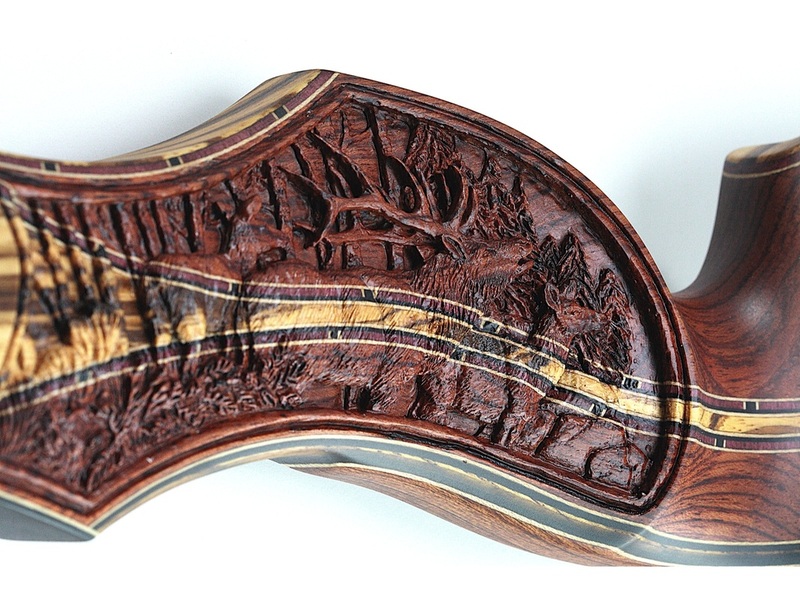 Rotating the riser, an amazing hand-carved scene is revealed —a bugling trophy bull elk (flanked by his two cows) is carved into the back of the grip. 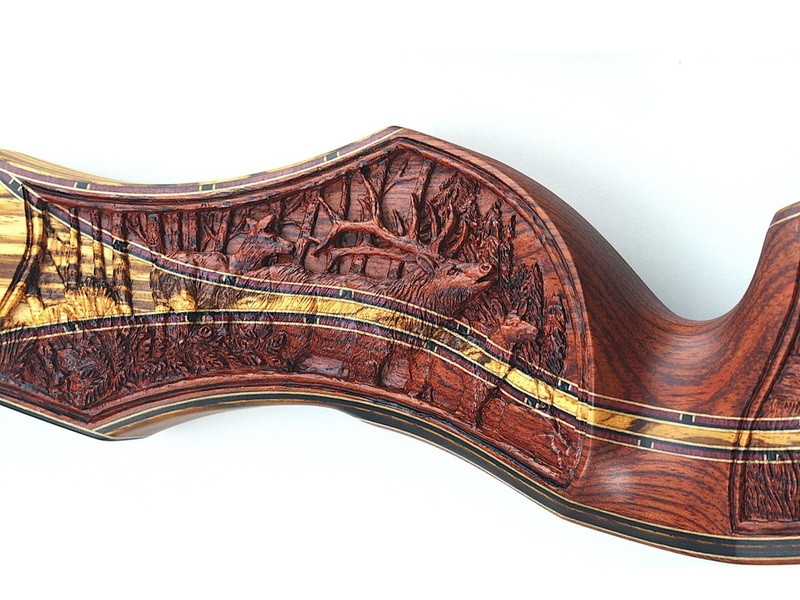 Our artist's deep relief, 3-dimensional carving technique harnesses light and shadows in a manner resulting in masterful realism. 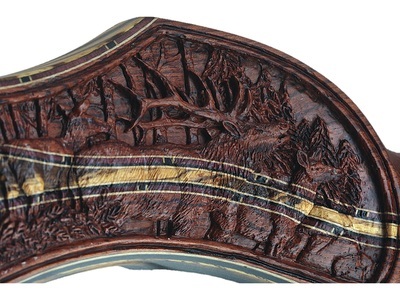 Careful inspection reveals a rival bull across the river, nestled in a magnificent mountain scene lightly carved into the back of the site window. The design concept of this special edition bow incorporates our extremely durable marine-grade epoxy finish that (in combination with these exceedingly hard woods), results in a remarkably practical hunting bow. 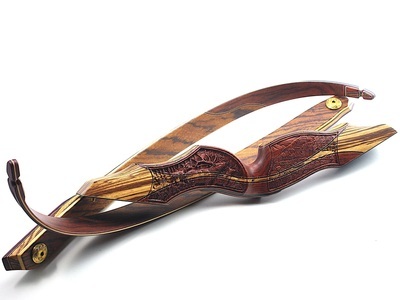 To be clear, this is a fully functional, extremely durable archery instrument that yearns for action in the field. 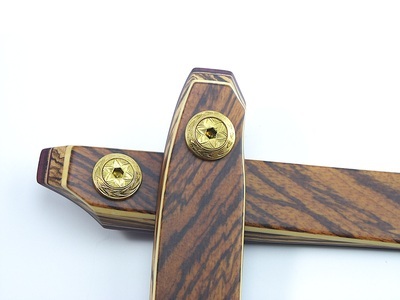 To compliment the presentation, a beautiful set of our solid brass, hand-engraved Forest style limb bolts and bezels are included with this masterpiece bow.